Studying abroad is a once in a lifetime opportunity for most so it’s important that you take full advantage of it. Costs can add up fast but we’re here to lessen your financial burden so you can explore more. Isn’t that what it’s all about? We offer some top study abroad flights for students and youth that fit your college budget. Whether you’re venturing abroad in London, Madrid, Paris, Hong Kong, South Africa or more, we’ll get you some of the best student flight deals possible. Visit more cities, learn more history, experience new cultures. Travel for less and live for more. Take advantage of discount student flights by becoming a member and unlocking special student & youth pricing. Visit our promo code page to double up the discounts. The earlier you book your study abroad flight, the better. Be flexible when departing. Avoid the weekends if possible. Be flexible when booking. Tuesday’s and Wednesday’s are usually the cheapest days. Be flexible with times. Typically early morning or red-eye flights are cheaper. 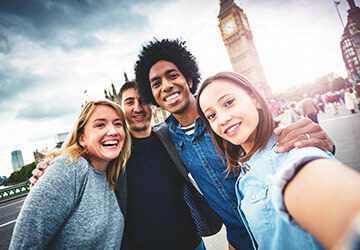 If you’re studying abroad in Europe, fly into a less expensive city and book a cheap flight or train ticket within Europe to your final destination. *A Note About Flight Prices: All prices were current at the time this was published. Prices are subject to availability and subject to change without notice. Prices are based on searches done in the last 14 days for roundtrip flights from the United States to select destinations with departures between January 2019 and February 2019. Flight prices vary by date, departure city, arrival city and availability. All taxes/fees are included in the price, except certain government taxes, change fees and fees imposed in destination and airline baggage fees if applicable.